The nutcrackers (Nucifraga) are a genus of two species of passerine bird, in the family Corvidae, related to the jays and crows. 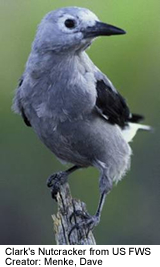 One, the Spotted Nutcracker (Nucifraga caryocatactes), occurs in Europe and Asia, the other, Clark's Nutcracker (Nucifraga columbiana), in western North America. The most important food resources for both these species are the seeds (pine nuts) of various Pines (Pinus sp.). In some regions, the seeds of Spruce (Picea sp.) and Hazel nuts (Corylus sp.) form an important part of the diet too. The bills of these birds are specialized tools for extracting seeds from pine cones. Surplus seed is always stored for later use and it is this species that is responsible for the re-establishment of their favoured pines over large areas either burnt in forest fires or cleared by man. Various insects are also taken, including bee and wasp larvae, and also birds' eggs and nestlings, and dead animals - if it is found. Nesting is always early in this genus, so as to make the best use of pine nuts stored the previous autumn. The nest is usually built high in a conifer. There are normally 2-4 eggs laid and incubated for 18 days. Both sexes feed the young which are usually fledged by about 23 days and stay with their parents for many months, following them to learn food storage techniques. Neither species is migratory, but they will erupt out of their ranges if a cone crop failure causes a food shortage.